Coulonces is 12 kilometres north of the town of Argentan. There is 1 Commonwealth burial of the 1939-1945 war in the churchyard, in the south-west corner. 414519 Warrant Officer Clarence Alfred Seeney, Royal Australian Air Force, died 25th JUly 1944, aged 21. Son of Alfred and Madge Seeney, of South Brisbane, Queensland, Australia. INSCRIPTION. HIS DUTY FEARLESSLY AND NOBLY DONE. EVER REMEMBERED. MEMBERS OF SPITFIRE NO. 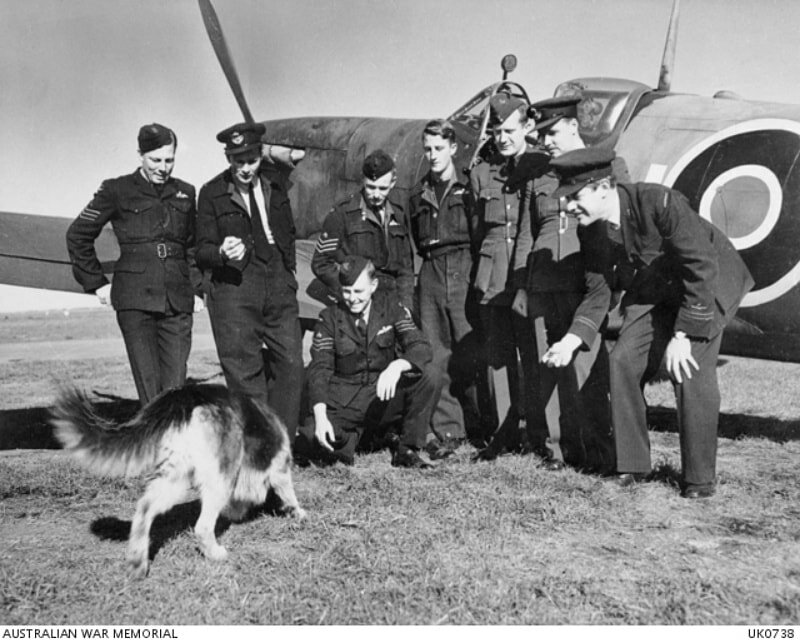 453 SQUADRON RAAF AT RAF STATION PERRANPORTH, THE ONLY AUSTRALIAN SPITFIRE SQUADRON, HAVING A LAST GAME WITH THE SQUADRON MASCOT "SPROG" WHO HAD TO BE LEFT BEHIND WHEN THE UNIT MOVED TO A NEW LOCATION AT THE RAF STATION SKEABRAE IN THE ORKNEYS. LEFT TO RIGHT: 414519 FLIGHT SERGEANT (FLT SGT, LATER WARRANT OFFICER[WO]) CLARENCE ALFRED SEENEY, GATTON, QLD (LOST ON OPERATIONS OVER FRANCE ON 25 JULY 1944); 15326 FLYING OFFICER (FO) R. BUSH, SYDNEY, NSW, ENGINEER OFFICER; 409147 F SGT K. C. KINROSS, ESSENDON, VIC; 413296 F SGT H. F. WATTS, MILTON, QLD; 409160 F SGT R. LYALL, GEELONG, VIC; WARRANT OFFICER "JOCK" YOUNG, RAF RADIO OFFICER; FO F. J. CATCHPOLE, RAF INTELLIGENCE OFFICER; 261892 FLIGHT LIEUTENANT H. SHARP, SYDNEY, NSW, MEDICAL OFFICER.